Lady Walton's cookies were on sale at my Costco. These very thin cookies have two layers of crispy cookie with a dark chocolate center, made from 61% cacao. The cookies are crispy and chocolaty and large. The Costco box contains 32, divided into 4 foil packets of 8 each. These might work as sides of a very elegant ice cream sandwich, but the ice cream at my house isn't lasting long enough to try this out. Trying to find the origin of the name, I googled and discovered that these cookies are a version of a stroopwafel, a cookie that originated in the early 19th century in the Netherlands. Traditionally these are placed over a hot drink to warm. After a short time resting on a hot cup, the chocolate melts but the cookie sides stay firm. This is surprisingly different and worth trying. 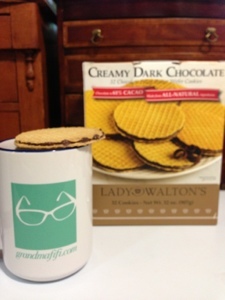 The Lady Walton cookie company, located in Dallas, Texas, was formed by two sisters, Susan and Mary Walton, in 1988, and named after their mother, who made stroopwafels at Christmas. The ingredient list is reassuring, with no preservatives; and all ingredients sound familiar.